Its advanced BIM capability has landed light gauge structural steel specialist Metsec an appointment by Skanska to supply steel framing for 66 Queen Square. Currently in mid-construction, this state-of-the-art office development in the heart of Bristol features a structural solution that has benefited from intelligent supply chain collaboration and a transparent, model-based design process. Skanska is constructing a 5,667m2 development that will provide airy, light-flooded open plan office space upon completion in summer 2015. The five-storey building incorporates historic Queen Anne House, a Grade II listed Georgian terrace. Renovation of Queen Anne House and the new build are being carried out consecutively. The speculative development at 66 Queen Square, being delivered under the Workplaces by Skanska banner, is seeing the smart combination of heritage with innovative new build to create a prestigious commercial space, which is the first venture of its kind in the UK by the company. The development is designed to meet BREEAM ‘Excellent’ level as well as EPC A to minimise the building’s environmental impact and thus satisfy the energy efficiency demands of a modern office building. At the same time, the contractor has adopted design and construction methods to suit the historic setting. Once complete, the building will blend in with the unique architecture of the Georgian townhouses surrounding the 18th century Queen Square gardens. At the core of this ambitious project lies a combination of technical excellence and tight-knit supply chain collaboration to realise outstanding building design that delivers on aspects of sustainability, building performance and aesthetic appeal, as well as project lead time. “The fusion of new and old on this site has been an incredibly tough challenge,” confirms Derren Masters, Design Director at Skanska. “We were aiming to be sympathetic to the design of the listed building existing onsite but we also needed to find a reliable way to connect the new office building to Queen Anne House, without damaging its basic structure. When it came to designing a framing solution that would smoothly integrate with Queen Anne House, Skanska contacted Metsec, who offer the design and modelling capability that Skanska was looking for to ensure that its design team got the structural design right from the beginning. “The fact that Metsec had experience of working in BIM and could support our work with a BIM-compliant model for the steel framing system allowed us to consider Metsec elements at a very early stage”, Derren Masters points out. The lightweight structural steel specialist created a BIM model that contained all the required elements for its SFS infill walling solution: stud, track, deflection heads and compound members, as well as fixing accessories. From this data-rich file, Metsec produced the drawings and material schedules that would inform Skanska’s structural design plans. Roy Burns, Managing Director of Metsec’s Purlin and Framing Division, agrees that closer cooperation between teams through improved information exchange held the key to better design, “From a technical viewpoint, it was important to be able to feed our designs into the contractor model as it illustrated exactly how our framing system was going to sit within the wider structural solution. To see Metsec and Skanska bring BIM to life onsite at 66 Queen Square, watch the video on the Metsec Website or YouTube. 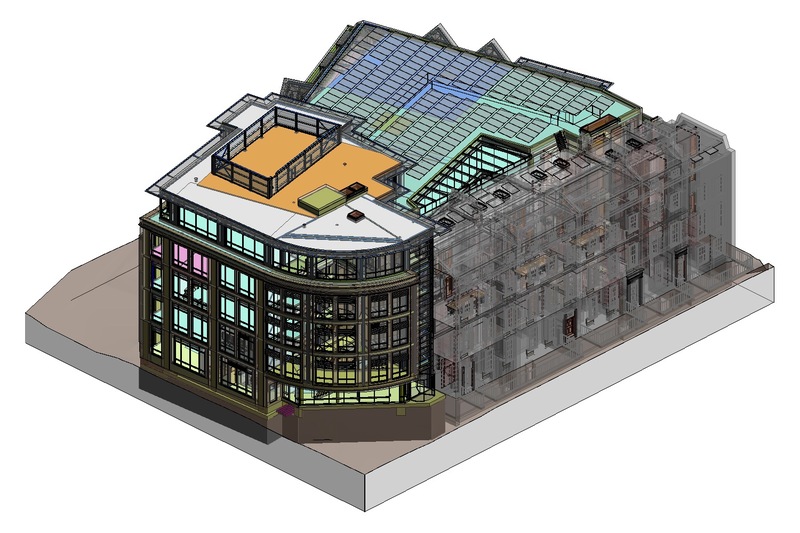 66 Queen Square, Bristol won “BIM Project Application Award” at the British Construction Industry Awards 2014. For more information on Metsec and its BIM modelling service, please go to www.metsec.com and follow @MetsecUK on Twitter to join the debate, using #BIMinAction.